Hi, my name is Jonathan, a motion designer, and the latest member to join the Napoleon Creative team. In my time here so far, I’ve learnt that you need many different skills to make a project successful. Not just animation techniques and illustration, but the ear for the right background music, and getting the best performance from a voice over artist. In this post, I’m going to share the voice over tips I’ve learned. With this in mind I was offered the chance to attend a beginners voice over workshop at The Showreel, a voice over training company based in Soho, London. They run all different types of training sessions such as, character workshops, personal one-to-one workshops and accent workshops. I’ve learned some great voice over tips. After covering the basics of the role of a voice over artist, the second part of our training was getting a variety of scripts for possible scenarios we may have, from a charity read to a serious documentary or a corporate read to an advertisement. The teacher asked me to read a charity script, I was nervous and unsure of what to expect. I tried the read on my own with no guidance or music. My read was then played back for everyone to hear and the advice I got from the tutor was, ‘More energy, emphasis on certain words and wave my hands around!’ The second and third read had different music playing while I was reading the script and this gave a better result as you get a better understanding of the style and read for the voice-over. After my turn was done, I felt more confident after gaining the experience of a voice over artist and cannot wait to go again. I got to see how the other people in my group did, learning from their strengths and weaknesses. We carried on reading various scripts until the end of the day and every script enabled us to be more creative with it and change things up different situations. 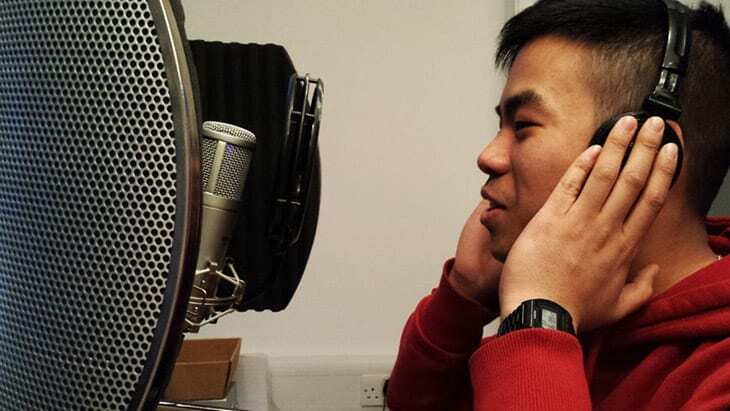 The workshop built my confidence and gave me insight of how a voiceover artist works. Now I’ll be applying the voice over tips when selecting and editing voice overs for our projects. Animation February 12, 2015 What’s the harm in an animator/account handler hybrid?